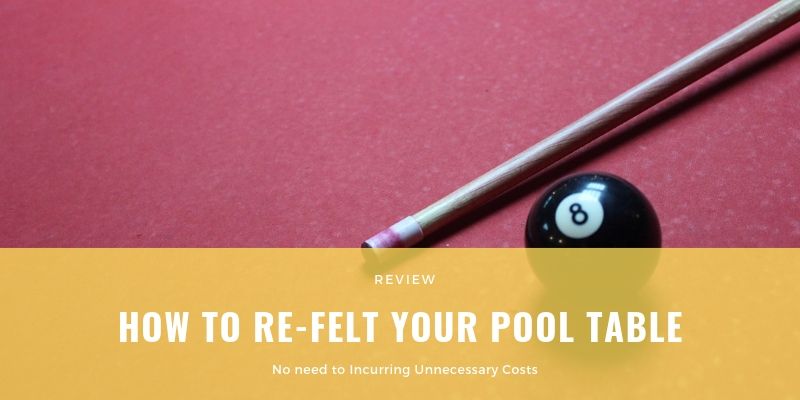 Although it is highly recommended that you hire a professional to install your replacement billiard felt, you can properly install the felt yourself. If you are looking to create a perfect playing field, you may want to get a pro to do this. If you are just using your pool table once in awhile for recreation, then you could very well install it yourself. To find out which size pool table felt to purchase for your table, please follow the guide below. Measure from side rail to side rail where the ball hits the nose of the rail. Please note that the nose of the rail is the small “shelf” that runs along the inside of your pool table, not the actual side of the table. Cloth tolerance is up to 1″ +/-. If your table is disassembled and you are not sure of the size, measure the slate (L x W) and call us for details. Before you even put the felt near the table, please make sure that your old felt has been removed properly and that any adhesive residue has been removed from the slate bed. Once you have a clean surface to work with, find the top side or playing surface of your replacement felt. This is usually signified by a sticker. Unfold and center cloth, playing surface up, on top of the clean slate. Make sure the overhang is equal on all four sides. Starting at one end of the table, fold the cloth over and expose about 3 inches of slate. Carefully spray a 1-1/2″ wide strip of regular spray adhesive along the top edge of the slate. Also spray the outer edge, avoiding the pocket cut outs for now. Repeat this procedure at the opposite end. Allow the adhesive to set until tacky to the touch. This will generally take a few minutes. After the adhesive has set, secure the cloth at one end of the table by starting in the middle and smoothly stretching the cloth out to each of the corner pockets. Move to the center of the opposite end of the table. With one hand, pull the cloth tightly toward you until you have a 1-1/2″ fold in the center of the cloth and with the other hand press it firmly into place. Pull the sides of the cloth tightly toward their respective corners. Smooth and press firmly, always working from center to corner to avoid bunching. Repeat this process on the sides of the table. Start from the center pocket on one side of the table and pull toward you, taking up half of the fold from the center of the cloth. Smooth into place working from the center out to the corner pockets. On the opposite side start from the center pocket and pull toward you, taking up the remaining fold from the center of the cloth. Smooth into place working from the center out to the corner pockets. The cloth should be smooth and tight. Using your scissors or box cutter, trim the cloth until even with the bottom edge of the slate. Carefully spray adhesive on the edge and underside of the pocket area. Also spray the underside of the cloth. Cut 3 pie-shaped wedges in the cloth at the corner pocket cut outs. Fold cloth down and under to wrap cut out edges. Cut 5 pie-shaped wedges in the cloth at the side pocket cut outs. Fold cloth down and under to wrap cut out edges. Be very careful to not cut past the table’s top edge and into the playing surface when cutting the wedges, otherwise you may develop a slight bump right at the entrance of the pocket–making slow velocity shots very difficult. Press the cloth firmly against the slate along the curve of all pockets. Trim off excess cloth with scissors. Set all of the rail pieces into position on your table top. Attach a rail center piece to one of the side rails with a screw. Repeat for the other rail. Place side rail sections together and loosely attach to the base on the underside of table with hex bolts and washers. Loosely attach the end rails in the same manner using hex bolts and washers. Slide your corner pieces on loosely. Adjust the rail fit as needed. Secure corners on the underside of the table with Allen bolts and washers. Tighten all rail bolts securely. Make sure you don’t attach the rails tightly the first time around. If you tighten them too much to start, you can end up pulling the pool felt. Once they are all loosely in place it is safe to start tightening the screws. If you are looking for a custom pool table felt in the market, choosing the most appropriate product is highly important. In fact, most people wonder what is the purpose of a felt for a billiard table. One aspect of having a pool table felt is to make sure that your playing experience is highly enjoyable. The reason for such consideration is that there are various kinds of pool table felts and the needs of different people tend to differ. For instance, there are many that have pool tables at home that makes for a great addition for use by family and friends. Even bar managers, youth community centers, and other public recreational facilities, as well as where tournaments are held – each have a varying need regarding the kind of felt used on the pool tables. It depends on your requirements which reflect on your choice of pool table felt. The prospect is to make a selection of these products depending on your table specifications. There are 3 vital aspects to consider when getting your custom pool table felt. The key is to ascertain the weight of the cloth, material type, and also whether the table requires a felt that is specifically treated to resist stain from spills. There is a need to realize how frequently the pool table will be used. Also, the manner in which the billiard table and essentially by whom is also important. These are the essential factors to consider for the type of pool table to be felt. You will want to choose the specific felting variety that is most suitable for pool playing. A proper felt works well to ensure that your game table resists any unnecessary damage. Make sure that you take out time to decide exactly the type of felt that is best suited which saves you money. The most common kind of pool table felt is made from woolen cloth. It is essentially the felt that people are familiar with. The material is thick and heavy having a velvety feel to it. It is usually less expensive and is found in homes and places for recreational activities. You will find that the pool table felt is available in a range of varying thicknesses. This can be infused with cushioning so that the balls run across the surface smoothly. There is the provision to avail the required color of the felt so that it goes well with custom designed pool tables. There are a number of accessories required to fit the pool table felt. In such cases when the felt does not contain a proper backing, a lining can be laid beneath the felt to increase its efficiency. For those that have a custom billiard table at home should invest into a quality felt. It is the felt type which reflects on the efficiency of the game and ensures that the experience is quite satisfactory. The best part is that it not only elevates the decor of the pool table but enhances the play a great deal. Your excellence in the play hugely depends on the felting of the billiard surface as it is responsible for the smoothness.